How do you use IPython? How would you like IPython to improve in the future? In total, it attracted 240 responses, which can be viewed here. Thank-you to everyone who answered our questions. ** Countries after this marker were only recorded by one respondent. 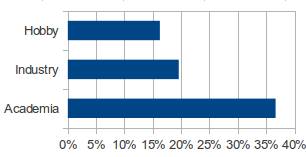 The majority of users use IPython on Linux (80%), with Windows (38%) and Macs (32%) roughly equal. One user listed NetBSD, and one listed Solaris. Predictably, all respondents use the interactive shell. 15% also use parallel computing features. Among ‘Other’, the only recurring answer was embedding IPython. Note that the Qt console & HTML notebook were not included, as they weren’t released when the survey started. Many respondents are in academia (37%), and they mentioned diverse branches of the sciences. 20% of respondents are in some form of industry (five mentioned finance), and 16% use it for personal or hobby development. 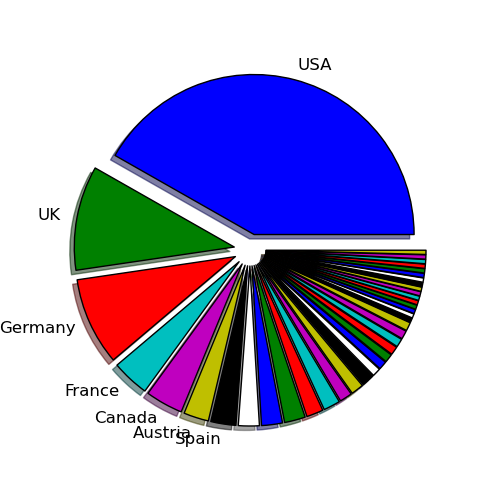 There was considerable overlap between groups, with many users in academia and industry also using IPython at home. In addition, six respondents mentioned that they were learning Python or programming, and three that they use it for teaching. Note that these figures are collected from a free text answer, so they’re somewhat subjective. No theme seemed to appear in the answers to where future development should go. I interpret this as a good sign—there’s nothing our users feel is clearly wrong. Some users requested features that already exist, especially features in the latest release (e.g. multiline editing, Python 3 support). Hopefully this will improve as new releases get into distributions’ repositories, but maybe we should promote key features better. 10 respondents suggested that the documentation could be improved. At least 8 users talked about better ways to reload modules. This seems to be a fundamental difference between Python and MATLAB, but perhaps there are ways of easing the experience for switchers. 8 respondents either use IPython in Emacs, or said that they’d like better emacs bindings. Unfortunately, none of the core developers are motivated to learn Emacs lisp, but we welcome contributions from Emacs users. 5 people mentioned better support for Windows. We’re keen to support any platform, and we have fixed many Windows bugs, but the main developers are Linux or Mac users, so we rely on others to report issues. We have a productive collaboration with Enthought, who bring IPython to many Windows users through EPD. Every question, however, must be balanced against keeping the survey short so that people finish answering it.